Located between the desert and sea on Western Australia's north-west Coast, Broome is Australia's pearl industry capital and a naturally beautiful holiday location. An internationally renowned tourist destination, the seaside township of Broome was founded on deep sea pearling, an industry that still produces some of the world’s most beautiful and unique pearls. Offering a wide mix of cultures, people, food and events, Broome has become a popular holiday destination for both international and Australian travellers. 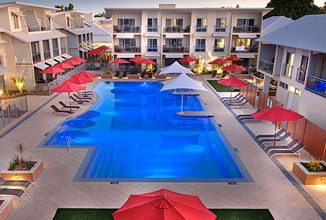 Major attractions include glorious sunsets, Cable Beach and a sparkling blue ocean to enjoy. Families will find lots of fun activities and attractions to entertain. Discover dinosaur footprints at Gantheaume Point at low tide, take a fishing charter, hire a boat or kayak to explore surrounding rivers and creeks. Book a tour of Broome’s Bureau of Meterology, see Malcolm Douglas’s Crocodile Park and the Broome Recreation and Aquatic Centre. For a more educational experience, take a self-guided cultural walk through Minyirr Park or call in on the Broome Historical Society Museum.